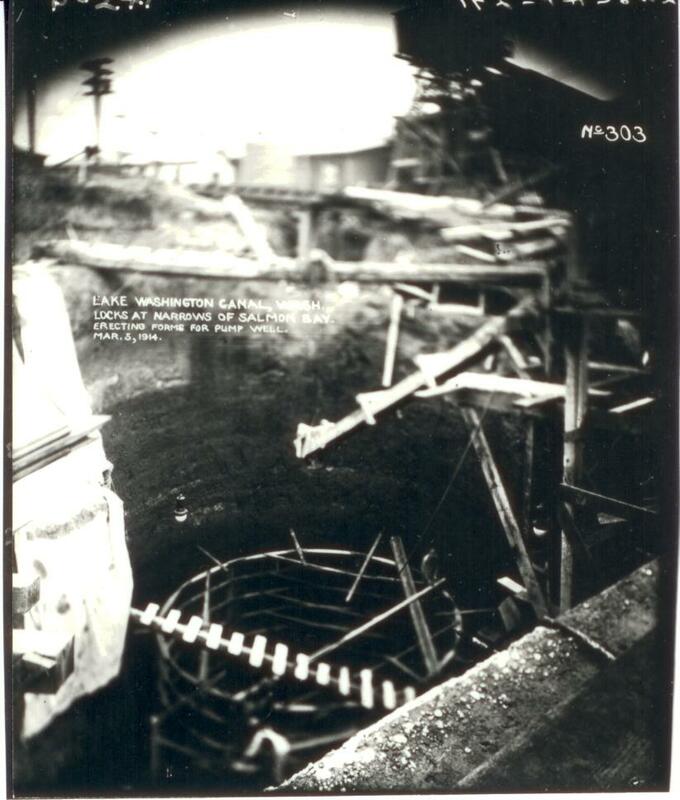 When construction of the Hiram M. Chittenden locks began in 1913, it wasn’t just the locks that had to be built. The large concrete building that many people walk by today when coming across the locks was started at almost the same time. Currently, in addition to being the locks’ administrative offices, it also houses the massive pumps used to empty water from the locks during the annual “pump-outs”. The Administration building, or Powerhouse as it’s called in early photographs, also has a distinguished architectural pedigree in that it was designed by Carl F. Gould. Mr. Gould was one of Seattle’s leading early 20th century architects and designed, in conjunction with his partner Charles Bebb, several well known buildings in Seattle. Mr. Gould himself is responsible for designing the Suzzallo library, on the University of Washington Campus, the Seattle Asian Art Museum, and the Pacific Medical Center building on Beacon Hill. The Administration building is an early example of the use of concrete as a building material and it can be seen in several other structures at the locks including the control houses and maintenance buildings. 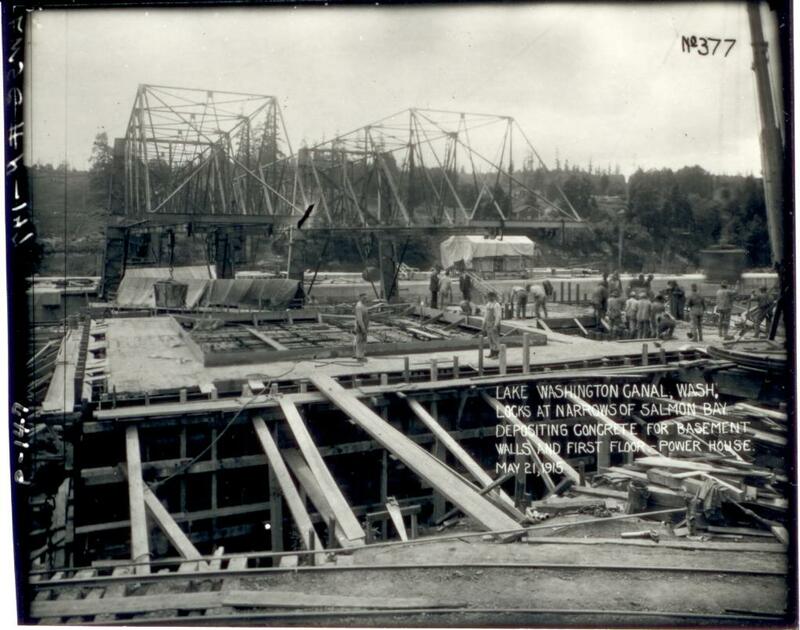 Designed in the Second Renaissance Revival style, the 47 x 67 foot Administration building served as the initial multi-purpose public building at the locks and required 14 sheets of architectural designs. It features an oval ceiling light of textured and colored glass and terrazzo floors with geometric trim of Alaska and verde antique marble. Additionally, the wood panels and trim used throughout the building is varnished oak. A unique touch is the brass plaque at the center of the lobby featuring a castle structure—the symbol of the U.S. Army Corps of Engineers. Also, be sure to check out the bronze dolphins that support the light globes at the south entrance of the building. These are the only external light fixtures which have remained intact throughout the locks existence! Next time you’re at the locks, during the weekday from 8am to 4pm, be sure to go inside and see the many original design elements still present. The Administration building taking final form in the fall of 1915. 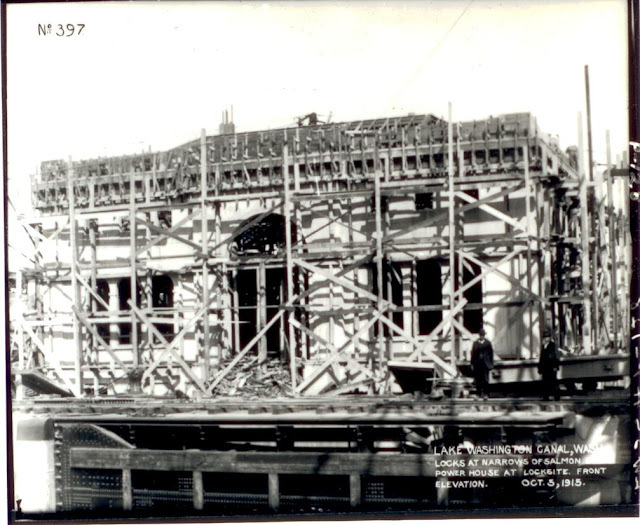 The basement and first floor are just emerging by spring 1915. Early spring 1914, construction of the pump wells, underneath the Administration building, is taking shape.